There were around five cameras placed around and the scene would be assembled from quick cuts from everywhere. Nicky Allder was operating the Chestburster. The contraption had two buttons one was for pushing it through Kane's chest and the other was for the blood. The rigs were all charged and ready, Nick Allder working the ram and the effects team working the blood pipes. The actors couldn’t see these properly hidden under the table, so were really not sure what to expect. Tiny Nicholls had the T-shirt prepped and on the dummy, all ready to shoot. Roger Dicken afterwards would take over to operate the Chestburster as if it were a glove puppet. 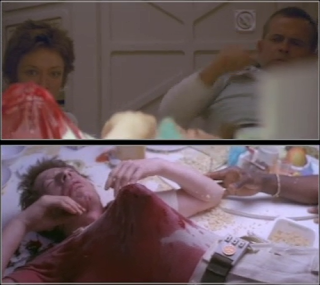 Ridley didn’t really explain to the actors at all what would happen, just gave them positions for the cameras. When everything was ready the cameras were rolled and finally Ridley said "Action". Kane turns his head from side to side in agony. As John Hurt squirmed and rocked on the table, the props men also rocked the false chest to make it look like it was Kane writhing. A gruff voice prompts Parker "what's happening with this?" Parker yells out " Doc what's happening with this!" Kane shakes his head from side to side and screams out in pain drowning out everyone else's voices as Parker and Ash hold onto his arms. The gruff voice speaks out to prompt Yaphet again" What is it?" Yaphet as Parker roars out "What is it?" Ash yells "Hold him! Hold him! For god's sake hold him down!" The head started bumping against the shirt. Nick released the hydraulic ram to fire the baby alien through the T-shirt and the effects team worked the blood pumps. The chestburster goes wham, the T-shirt bulged up as if something was about to burst through, but the head didn’t actually break through. - the acid hadn't weakened it enough. Continuing with the take Ash releases his grip on one arm and steps back and Parker begins to loosen his grip on the other arm. It still looked pretty horrible. Another splatter of blood suddenly appeared on Kane’s shirt, staining it further, but did not spray out as Ridley had hoped. It still shocked the actors, who were all leaning in closely over Kane, trying to help him cope with the agonising pain. What the eye doesn’t see the mind makes real, and perhaps this false start increased their anticipation and in the end it was another cut that helped Ridley create the tension for the audience. Someone yells in the background perhaps to prompt Ian "Jesus Christ!" As Lambert, Veronica's eyes were focused phallic thing coming in and out of the chest stretching the material of the t-shirt like a piston spurting small amounts of blood. Ian Ash backs away leaning against the wall, and slowly picks himself up muttering "Jesus!" John Hurt's face is hit with another splash of blood on the face until Ridley gives the word "Cut it"
He wanted the chestburster to come out through the t-shirt before he would get to the next stage where airlines with pipes would to shoot blood all over the cast. A male voice perhaps with an American accent in the background asks out loud "What's happening? An English crew member's voice says words near enough to "Mark it!" Harry Dean Stanton says "Hold the blood "